- Basingstoke on the 8th of May on Endocarditis, please email Jonathan (jwh204@hotmail.co.uk). - BCS national training day Mon 3rd June. Conference registration is now open. 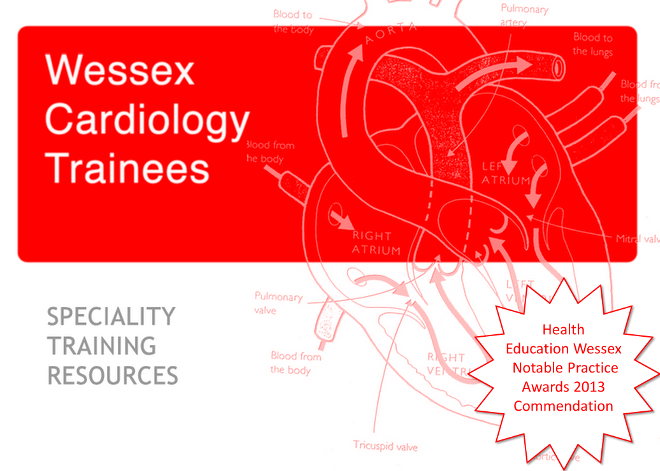 - Portsmouth on the 17th July on arrhythmias, ECGs and device programming, please email Hannah (hannah.sinclair1@nhs.net). - 14th May in The Green Man in Winchester. Come along and hear about all the fellowship opportunities in Wessex. 5-10 minute presentations from trainees who have done the various fellowship opportunities in Wessex. Ask any questions you like over dinner. Email Hannah if you want to attend. - Myself and Jonathan are organising a Wessex SpR evening out on Tuesday 4th June, more details to follow so keep it free. A good accommodation option is Easy Hotel, which a few of us used last year. The ARCP page of this blog is now live. I hope that this will bring all of the information that you need to pass your ARCP into one place so that it can be easily found. The page also includes dates for ARCPs, PYAs, reviews and rotation planning. Please have a look, I hope you find it helpful. Please let me know if there are any issues and queries - jwh20485@gmail.com. Thanks to all those who attended the coronary training day. The next training day is in Basingstoke on the 8th of May on Endocarditis, please email me to register your interest. 1. We have just been updated that the Portsmouth training day will be the 17th July. Topics to include arrhythmias, ECGS and device programming. Further information to follow. 2. The next evening event is Tuesday 14th May. The venue has changed to the Green Man in Winchester. The topic is 'research and fellowship opportunities in Wessex'. Please let me know if you would like to attend: hannah.sinclair1@nhs.net (note the email typo on previous blog message - apologies). 2. The British Society of Cardiovascular Imaging (BSCI) Spring meeting is on 16th-17th May in Cambridge. To register click here. Medical trainee member rate £50 including dinner. Training day updates, key points from the STC and a possible Brazilian connection! A few updates for your Monday morning! 1. The coronary training day at Southampton is one week away (1st April, seminar room one, heart beat centre, Southampton Hospital). We still have plenty of spaces so please email me if you'd like to sign up - jwh20485@gmail.com. After this, the next training day is in Basingstoke on the 8th of May, this will be on infective endocarditis and should be an excellent day, please also email me to register your interest! We are continuing to finalise more training day dates, please check the training day page of the blog to sort your study leave early! · There is a move to co-ordinate sub-speciality training applications across the deanery. It is likely that this year heart failure posts will co-ordinate to offer a two year training post across different trusts in the deanery. Other sub-speciality posts may follow this pattern in the future, as always keep an eye on the opportunities and job adverts! o The STC have decided that BSE accreditation for transthoracic echocardiography is not mandatory for Wessex trainees. However in order to gain a CCT you must have completed either the portfolio echo accreditation tool or have BSE accreditation. We would however recommend BSE accreditation as we feel that this provides better recognition and is probably less arduous. o DOPs need to be supervised by a post CCT clinician who has undertaken the clinical supervisors’ course run by the deanery. All consultants will meet this requirement but if you are being supervised by a senior trainee the DOPs will only be counted if they meet these criteria. The exception here is that senior, BSE accredited techs are able to do echo DOPs. · It was again agreed that trainees from ST3-5 should attend 60% of training days as a minimum. Those trainees doing sub-speciality training only need to attend 2 of the training days and can substitute the remaining days with other courses relevant to their training. Self-certified evidence using the training day form should be provided at the ARCP. · Trainees in ST3/ST4 are reminded that they should attend a taster ACHD week at UHS. To arrange this you should contact Dr Carroll. 3 3. Finally it is likely that there will be an opportunity for one trainee at Southampton next year to undertake six week period in a hospital in Brasilia. Further details will be available in due course but do consider whether this is something you'd be interested in. If you would like more information please speak to Dr Paisey or Dr Simpson. The Basingstoke training day is going to be on the 8th of May from 9 - 4 in the ARK (at Basingstoke Hospital) on Infective Endocarditis and other Inflammatory processes of the heart. It should be an excellent day so please arrange your study leave now! Also thanks to all those who have already emailed me to sign up for the coronary training day on the 1st of April, we have plenty more spaces so please contact me to sign up - jwh20485@gmail.com. The next evening event is Tuesday 14th May. This will be a series of short presentations (from current trainees) about the various fellowships and research opportunities in Wessex. We are hoping to have another later in the year about opportunities outside of Wessex.